HOUSING campaigner Giles Binyon has got on his bike to show what life is like on two wheels on Pagham’s main road. Giles used a helmet camera to turn his experience on Pagham Road into a near five-minute film on Youtube called Pagham Road Life Cycle. His ride south past The Royal Oak in Lagness at 8am on Tuesday was made to show highways officials the congestion on the road before some thousand new homes are built in the area. Pagham and Aldwick Greenfields Action Movement (Pagam) member Giles said: “I felt that the road was very busy – as it always is. 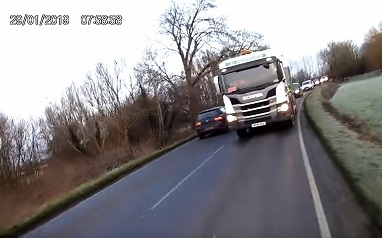 His film shows lorries and vans waiting for room on the narrow road to overtake him and cars backing up behind them. Going north past them is a constant string of traffic. Giles hopes his ride will convince officers that conditions on Pagham Road are causing problems. “It is only when this happens that we can begin to start to solve them,” he added. A better cycle link from Pagham to Chichester is planned as part of the housing schemes but this will involve a route to Sidlesham and then north.